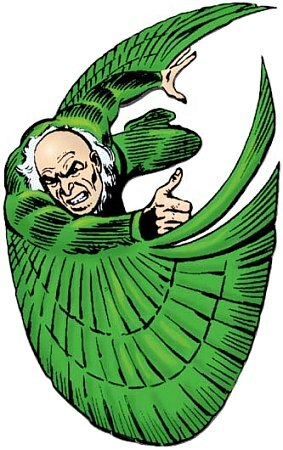 Flight: The Vulture's powers stem from his electromagnetic anti-graviton generator built into his costume. He mainly can fly silently for up to 6 hours at a maximum altitude of 1,100 feet with precise manuverability and great speed. He usually engages in ramming attacks but can buffet opponents with his wings. Enhanced Abilities: The Vulture’s suit enhances his strength, agility and endurance. Life Drain: The Vulture has the ability to drain the life force from his victims, which he uses to boost his health and remain young. Weapons: The Vulture sometimes employs weapons. These have included plasma pistols and several grenades of various types. The Vulture’s career as a criminal began when he discovered his then partner Gregory Bestman, in the engineering firm of Bestman & Toomes, had been cheating him out of his share of the profits. The elderly Toomes confronted Bestman and found he possessed incredible strength. Toomes had already begun work on his now infamous electromagnetic flying harness and discovered that exposure to its unique radiation had granted him super-human strength. Bestman threw Toomes out of the company. Enraged, the elderly inventor took his creation with him, to perfect it as a weapon against his former partner. Dubbing himself the Vulture, Toomes ransacked his former company, robbing the place blind. Intoxicated with his newfound power and the ease with which he committed his crime, the Vulture went on a wild crime spree, daring the police to catch him. This brought him into contact with Spider-Man.